San Francisco Bay Area sculptor Ted Bayer grew up in the Midwest but moved to Northern California after graduating from the University of Illinois. He returned to the Chicago area to receive his M.D. degree from Loyola University of Chicago, but has lived in the Bay Area since returning in 1977, raising his family of three children, practicing emergency medicine until he retired in November of 2007, and devoting much of his other time to artistic pursuits. After trying his hand at painting for a number of years, he began seriously studying sculpture in 1994, concentrating first on ceramic sculpture, then moving primarily to the creation of stone works of art in 1996. 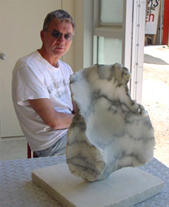 Ted first visited the Carrara area of Italy in 1997 and has traveled there many times since to work in the marble carving studios of Pietrasanta. It was in Pietrasanta that he initially learned the use of the sophisticated power tools used by the artisans working there and the point machines and calipers that allow one to measure clay or plaster models (maquettes) that are used in perfecting the stone sculpture itself. At the end of these Italian sessions he ships home both partially finished sculptures and unfinished stones to complete in his home studio in El Cerrito, California. Over the years he has become accomplished in carving both abstract and figurative works and though he still works from maquettes at times, he prefers to sculpt “free form” to create excitingly original pieces. Though initially he worked almost exclusively in Carrara marble, he has extended his work to include a variety of materials including Iranian golden or red travertine and Utah and Italian alabaster. He has made many beautiful sculptures from honeycomb calcite, a translucent stone which he obtains directly from a quarry in the mountains of Utah. Figurative sculpture was his first love when he began sculpting in 1994, and he frequently returns to it as an endless source of inspiration. Recent works include several pieces sculpted from stones without benefit of a maquette—allowing the stone itself to dictate the form that evolves. Examples are “Pearl”, “Heather”, and “Jewel”. Those “free form” works are interspersed with “Gemini” and “Jumping for Joy”, sculptures completed using maquettes that he created. A visit to Bayer Sculpture Studio in the El Cerrito hills will find him happily working in a garden setting surrounded by many of the sculptures that he and his wife Mary Bayer create and have strategically scattered about their home and outdoor property. A visit can be arranged by calling them in advance. The day I made my first sculpture, I suspected I was going to be hooked for life. Each day I am ever more convinced of my good fortune to be doing something that I so enjoy. I love creating art, and to be able to begin with a beautiful but untouched stone and shape it in a way that transforms it to a finished work of art from the basic material is intensely exciting. Every day spent in my studio is a wonderful new adventure.